When Life is Strange (Free) was originally announced back in 2014, it immediately shot to the top of my list of anticipated releases for 2015. Since then, I’ve played it multiple times across various platforms but had been constantly puzzled at the lack of an iOS version given the genre. I thought Square Enix and Dontnod Entertainment would’ve seen the value in putting their new adventure release on a platform where Telltale Games has seen success. Fast forward to today and we finally have Life is Strange on iOS and the port is mostly great. 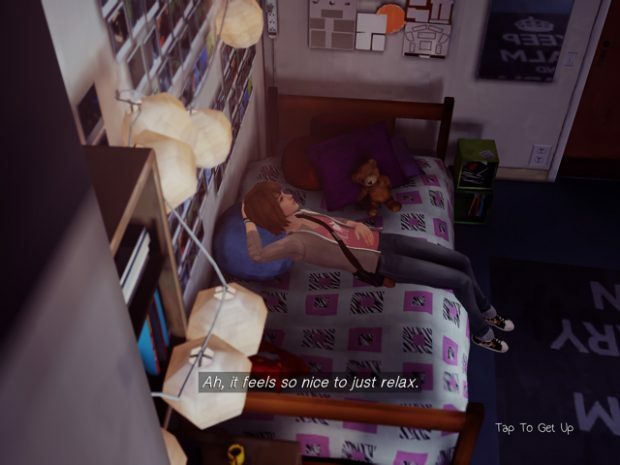 Set in the fictional Arcadia Bay, you play as Max Caulfield in this adventure. Max is a high school student at Blackwell Academy and the story begins with her having a nightmare. This nightmare sets the pace for what is about to happen over the next few episodes but she has no idea yet. After waking up, you get your first glimpse at school life and are introduced to how interactions work here. I love the pencil and marker animated look the UI has here. In fact the tone of the full experience reminds me of a good indie film with some aspects borrowed from TV shows like The O.C. and Scrubs. Some of the dialogue is cringeworthy and I love it. After the opening section Max discovers her gift in a particular incident. You can rewind time and this plays a big part of the story. Rewinding time isn’t just a way to redo decisions but a way to alter the story for the better or in some cases worse. There are some basic point and click adventure game puzzles here and some of them even require you to see a situation play out badly before using the time rewind to set things straight. I love how it affects dialogue letting you get a glimpse at all possible outcomes. Another great thing you will notice about Life is Strange is that decisions will actually make a big difference in the story as episodes go by. These aren’t just added for show. Photography plays a big part of the experience as well. Max can use her camera at certain locations to take optional photographs. These act as collectibles here. Some of them are pretty obvious initially but there are some super obscure ones. I don’t want to spoil the locations or the photographs but I had to use a guide back when this originally released to get 2 of the optional photos. I encourage everyone to explore as much as possible because the locations here are very well done. Even the hallway has so many nice touches when it comes to small things like graffiti and flyers stuck on the walls. I mentioned indie films before and this feel extends to the visuals as well. Dontnod’s visual direction here is stunning. There are obviously a few low resolution textures given this is a console port even on the iPad Pro I played on but the combination of the great lighting and the lovely art results in something memorable and great looking. On comparing it to the PS4 version I played before, characters have some low resolution assets but the overall feel is the same. It has been great replaying this on the iPad and iPhone. The only real complaint I have for visuals is the lack of proper lip sync. This was fixed to some extent through updates but it still isn’t great. Music and voice acting are definitely the highlight of the experience here. The use of licensed music for the opening credits as you walk through the hallway is fantastic. This game reminded me how much I enjoy the use of licensed music in games when done well. While the tracks from Syd Matters and Jose Gonzalez are great, the icing on the cake is Jonathan Morali’s score. On its own, it could easily be the score for a film like Juno. While the lip sync has some issues, the voice acting itself is great. Hannah Telle and Ashly Burch did fantastic with their roles here and it was hilarious listening to some of the cringey dialogue for the first time in over a year as I replayed this again. Outside of the small visual issues, the iOS port has a few problems. For one, controller support is basically non existent. Pairing my Steel Series Nimbus and switching the controls in game to a Joystick control resulted in the controller only working for movement using the left analogue stick. Nothing else worked. Thankfully the touch controls are great but take some time to get used to. Moving in and out of rooms or moving to a new area resulted in some slowdown on my iPad Air 2 but the iPad Pro 9.7 could handle everything almost perfectly. Life is Strange supports seamless iCloud sync which I took full advantage of while playing on the iPhone 7. Another thing to note is Life is Strange runs full screen on both iPhone and iPad. There are black bars for cutscenes on iPad though since those were originally widescreen on the target hardware it launched on. The in game journal also has black bars on iPad since they couldn’t be bothered to redo the art for it for the iPad 4:3 screen. Since this is the first episode, Dontnod did a great job with making me hate the episodic format upon release. The first episode literally had me craving for more and the wait for episode 2 was unbearable. You won’t need to worry about that because Episodes 2 and 3 are available right now via in app purchase with the remaining episodes launching early next year. 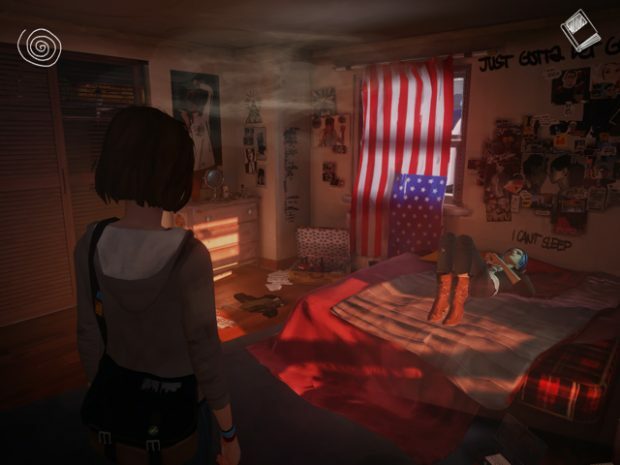 I hope the visual issues and some performance issues are ironed out because this could end up being the best way to experience Life is Strange. The lack of proper controller support is baffling because this exists on multiple consoles. Out of all the point and click adventure experiences available today, Life is Strange is my favourite by a long shot. I hope this does well for Square Enix so they can port Life is Strange: Before the Storm as well.